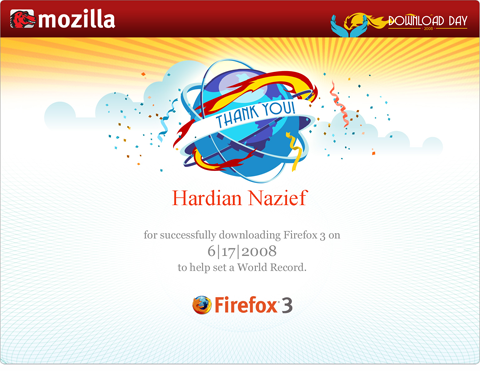 I just Receive Firefox Download Day Certificate :D. In just 24 Hours, Firefox 3 has been downloaded 8,002,530 times. U could see the Pledge Map on Spread Firefox site. You’ve Pledged and Downloaded Firefox 3? U should receive email notification where u should download it in the email address that u’ve registered :) Cheers! Didnt work for me !!!! Didnt work? U get the email right? check it in your spam message in case it accidentally identified as spam . I download the certificate in PDF shortly after i received the mail, just enter your name.